For our most recent Stress-Less Parenting challenge, we encouraged the HuffPost Parents community to try Christine Koh and Asha Dornfest's smart ideas for getting out the door with less stress on school days -- and we asked you for your best tips, too. 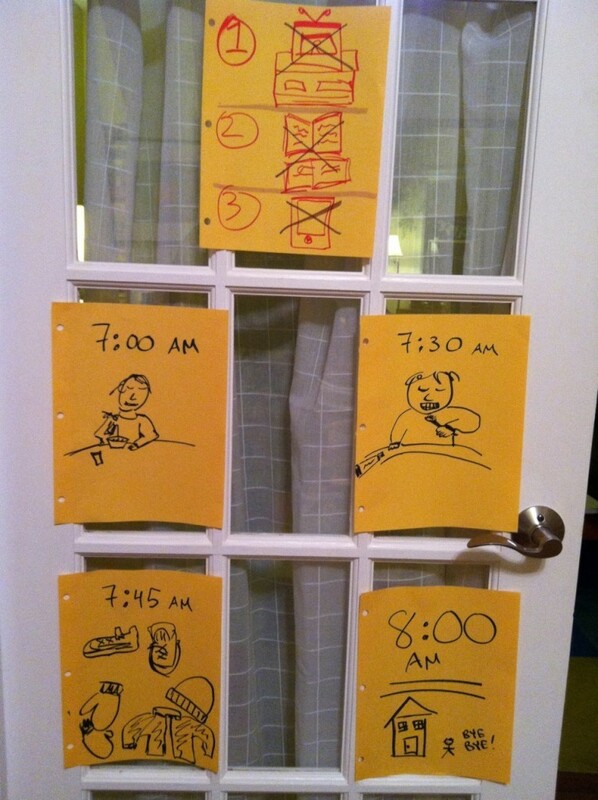 The responses ranged from practical ("lay out clothes the night before") to humorous ("let hubby do it"), but one submission stood out for its visual appeal. 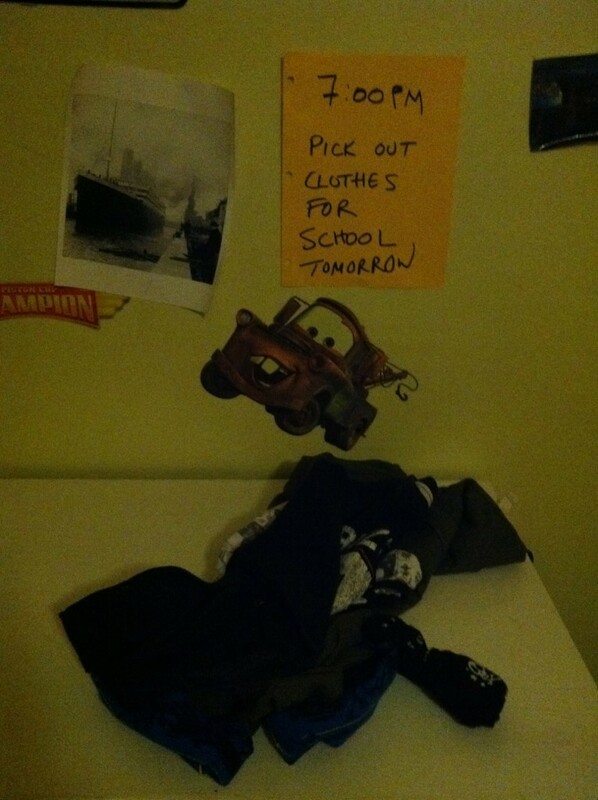 Mom of one, Lisa, sent us photos of signs she has hung up around her house to prompt her son Harry, age 6, to get ready for school in a calmer and more organized fashion. "The signs are a part of a continuing struggle to get out the door in the morning without fighting. I can't tell you how many times I go to work in a complete funk because my boy has aggravated both his father and I to no end," she told HuffPost over e-mail. Harry's preschool teacher, who is also Lisa's friend, suggested creating the diagrams, using clear, easy-to-follow instructions with few words and a focus on pictures. The concept is that Harry shouldn't have to rely on reading to get the message. As for the million dollar question of whether this approach works? Sadly, it doesn't really. Lisa says the signs were effective for a couple of weeks, but their novelty wore off and mornings are still frustrating. 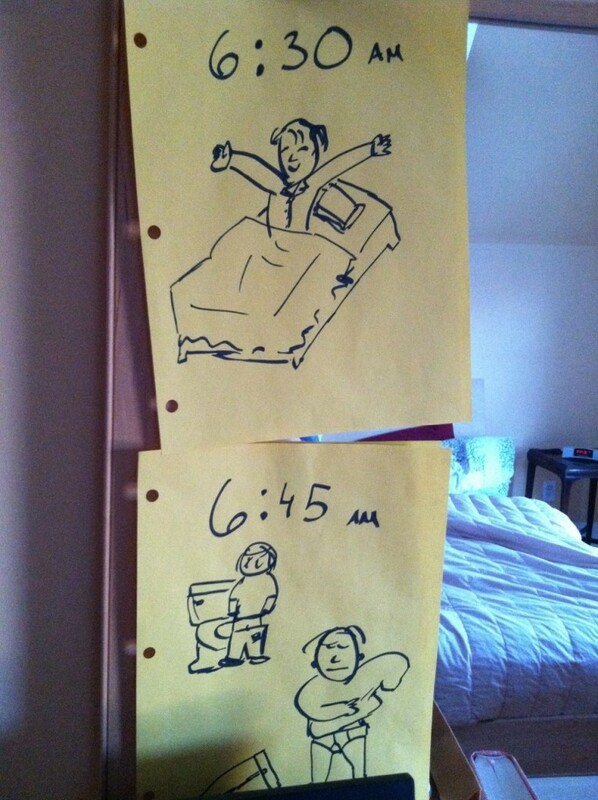 However, she adds, "I keep them up anyway, because it at least gives me something to point at when I'm nagging at him to put some pants on." Every little bit helps, right? What do you think? Would you try something like this in your house? Leave your thoughts in the comments and keep tweeting your best advice for less stress on school days to @HuffPostParents with #stresslessparenting.